Ana M. Eduardo, MD specializes in minimally invasive surgery at Hill Country OB/GYN in Austin and Dripping Springs, Texas. With 20 years of experience in women’s health care, Dr. Eduardo helps her patients regain their comfort and confidence through both medical and aesthetic services. Although Dr. Eduardo has been swimming in a sea of burnt orange since her graduate days, she remains a loyal Aggie at heart. Her path towards medicine began when she received her Bachelor of Science degree in Biology from Texas A&M University in 1987. She then went on to complete her medical degree, as well as her residency, at the University of Texas Medical Branch at Galveston. Dr. Eduardo has been board certified in obstetrics and gynecology since 1997. Dr. Eduardo specializes in minimally invasive surgeries and always incorporates cutting-edge technologies into treatments to ensure the highest standard of care for her patients. With certifications in innovative techniques like the da Vinci® Surgical System and BioTE® hormone therapy, and Votiva for vaginal rejuvenation patients can have confidence that Dr. Eduardo stays up-to-date with the evolving world of medicine. 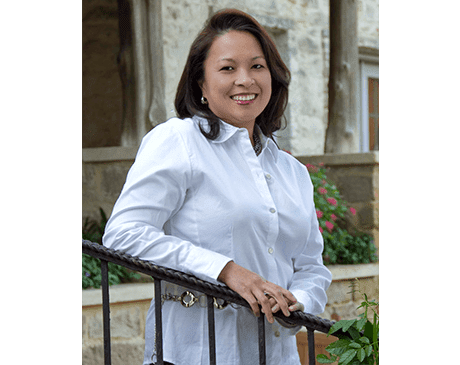 When she’s not helping patients at Hill Country OB/GYN, Dr. Eduardo enjoys traveling, cooking, and spending time outdoors with her husband, two kids, and the family dog.